Before using the Labs feature with your laboratory, your office will work with the MacPractice Labs/HL7 Department to configure an importing scheme that will allow the Laboratory to send the lab results from the laboratory's server to the MacPractice server. If you do not currently have Labs, contact a corporate MacPractice Sales Representative at (646) 305-9008 to purchase this feature. Once you have Labs Ability enabled on your license, fetch your license to update this information. A MacPractice support representative will assist you with the remaining steps. MacPractice User Group Privileges allow you to select individuals or groups to interact with and view the Laboratory lab results. In References > User Group Privileges, select a group. If you have Administrative privileges to adjust the User Group Privileges, you may adjust the Labs group to include privileges to view, edit, and work with lab results. Lock Lab Records: When enabled, the user can check the Locked checkbox on a laboratory order. Set Final Review Status: When enabled, the user can change the Final Review checkbox on a laboratory order. Set Preliminary Review Status: When enabled, the user can check the Preliminary Review checkbox. Unlock Lab Records: When enabled, the user can uncheck the Locked checkbox on a laboratory order. View Lab Records: When enabled, the user can view lab orders. If this privilege is not enabled, users will still see orders of other types, but they will not see any orders with a type set to Laboratory. Also review the privileges under the Order Ability. A user must have privileges to add, edit, and view orders, or they will not be able to add, edit, and view laboratory orders. Repeat the process for the other groups in your user group privilege list. Note: It is not possible to delete order records; they can only be closed, cancelled, discontinued, or archived. A commonly used importing design is a file/folder drop scheme using a SFTP (secure file transfer protocol) configuration, but you can use any importing scheme that allows a file to be sent over the internet securely and place a file in a folder from which MacPractice can import. The MacPractice Labs/HL7 Department will work with your office's Network Technician and the Laboratory Technicians to determine the best option for your office's Laboratory interface. Specific Firewall Guidelines may be found here. The MacPractice Labs representative will assist you with setting up preferences. Within the MacPractice menu, select Preferences. In the Abilities list, confirm Lab Requisitions is listed. If it is not, you may need to update the license to activate the new options. Please see our Fetch License documentation for instructions on fetching your license. In the Labs Preferences, select the Laboratory; the MacPractice representative will assist you with entering the correct data in the fields. Different fields may display or be required, depending on the specific laboratory you are working with. A. Lab Name: Select the name of the laboratory you will be receiving lab results from. B. Sends Preliminary Results (Only for LabCorp and Quest): This field must be checked for those two labs and remain unchecked for all others. Only a MacPractice representaive has access to unlock this. C. Incoming File Folder: Click the Choose button to select the shared folder where messages from the lab will be stored before they are imported into MacPractice. D. Outgoing File Folder (Not Required): Click the Choose button to select the shared folder where information from MacPractice will be stored before it is sent to the lab. This is just for your information, MacPractice does not send lab requisitions. E. Number of seconds to delay before checking change in file size: This field is used to determine how long MacPractice waits to see if a file has changed before it is imported. The default setting is 60 seconds. A delay set too low may import files not fully copied over slow networks. F. Default Form (Not Required): Allows you to select the form you would like to be used for printed lab results by default. G. Default Assigned To User: Laboratory orders created for this lab will automatically be assigned to the selected user. This overrides any settings on the Laboratory Order Type. H. Rejected File Folder: Use the Choose button to determine where MacPractice will store files from this lab that it cannot import. This file should be checked regularly, if importing stops or files are rejected, you will not be otherwise notified. Quest Diagnostics has a unique interface in MacPractice. 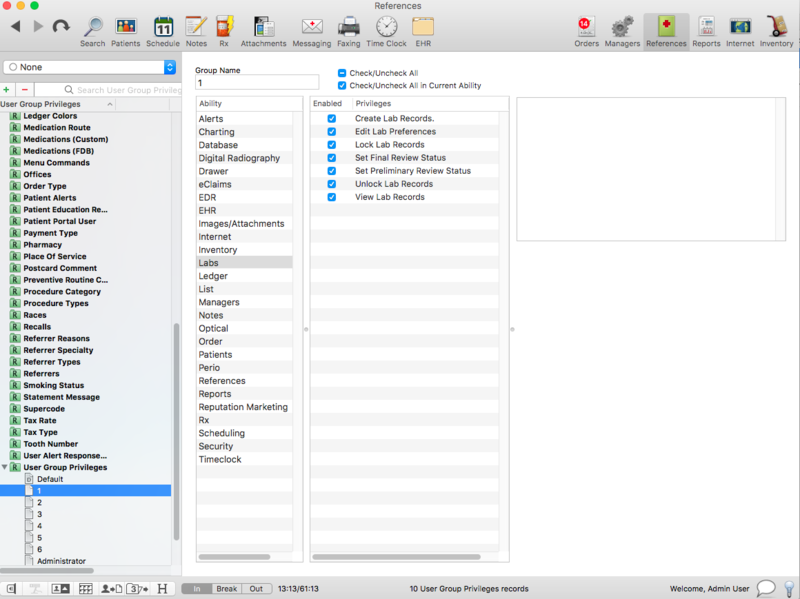 It uses an integrated FTP client within MacPractice that communicates with their host servers and pulls results from their host servers, instead of having the labs sent to a SFTP Host within the office. There are additional setup and testing steps for Quest. Instead of an Incoming and Outgoing File Folder path, a User ID and Password will be entered, as assigned by Quest Diagnostics. Read the full instructions for Quest Diagnostic Setup here. Once all of the setup is complete, some labs will have a testing period, while others will simply be ready to go. The representative assisting you with setup can help with any testing needed and a basic walkthrough of how to use the Labs Ability for managing results.